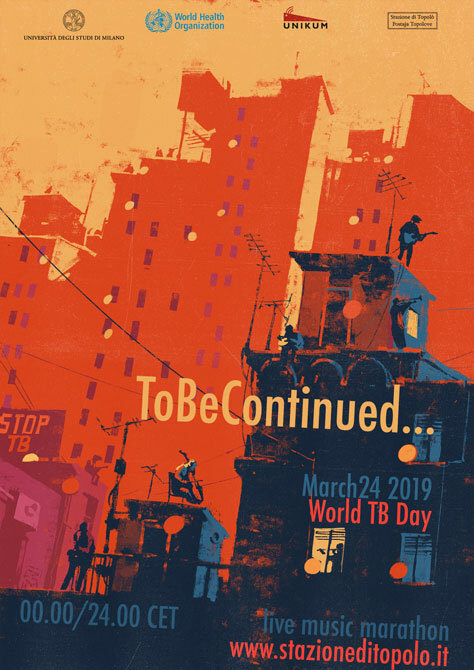 ToBe Continued is coming back on World TB Day celebrated on March 24th 2019, ToBe Continued is an original concert lasting 24 hours (from 00.00 hours to the midnight of March 24th, GMT+1), during which musicians from many countries world-wide will be connected to a website broadcasting their live concerts. During this un-interrupted 24-hour marathon (ToBe Continued... in fact) each musician has a 30-minute window at her/his disposal to create a relay of sounds and rhythms that will range across different streams of the "new music". The event, that will cover in its entirety the full World TB Day on 24th of March, is coordinated by Antonio Della Marina, musician and computer music composer, and by Moreno Miorelli, artistic director of the annual gathering "Stazione di Topolò/Postaja Topolove". The initiative is under the aegis of the Global Health Incubator, the 'laboratory' established in July 2009 in Topolò by Dr Mario Raviglione, today Full Professor in Global Health at the University of Milan, to create links between the world of creativity and that of science. The participating musicians will perform live from many different countries including Malysia, Chile, Costarica, New Zealand, China, India, Iran, Vietnam, Mexico, Argentina, Egypt, USA, Japan, Canada, South Korea, Brazil, Australia, Paraguay, Singapore, South Africa, Guatemala, Georgia, and many European countries (Russia, Belarus, Slovenja, Greece, Germany, Italy, Serbia, Sverige, France, Austria, Makedonia, Portugal, Spain, Norway, Bulgaria, Romania, Belgium, Slovakia, Transnistria, Great Britain, Hungary, Iceland), creating a symbolic tour of the world with 48 stops. The event includes several public listening points: bars, libraries, cultural centers, art galleries, shops, web radio, all listed on the website, that will broadcast the concert. The list will be published on the stazioneditopolo.it web page. Tuberculosis (abbreviated as TB in English and TBC in Italian) is a curable disease. Thanks to the strategies promoted by the World Health Organization in the last decades, consolidated today with all available innovations in what is known as the “End TB Strategy”, TB incidence and mortality have been reduced, although slowly. However, TB is still one of the top 10 causes of death in the world and the leading cause of death from an infectious disease with its 4300 victims every day. Unlike what many may think, TB is still a significant problem even in rich countries, where it causes suffering and deaths. The event is possible thanks to the collaboration with UNIKUM - Culture Centre of the University of Klagenfurt, that will provide the facilities for the coordination of the concerts. ToBeContinued this year has the patronage of the World Health Organisation and of the University of Milan. (and 2017, 2016, 2015, 2014, 2013, 2012, 2011, 2010).